May 12, 2006 More Dump Truck Wrecks on Corkscrew - On Tuesday morning May 9th, two accidents involving dump trucks occurred on Corkscrew Road. The first occurred around 5:41 AM at the intersection of Alico and Corkscrew. The second accident happened around 6:00 AM about one mile west of the Country Store where Estero High students waited for their school bus. 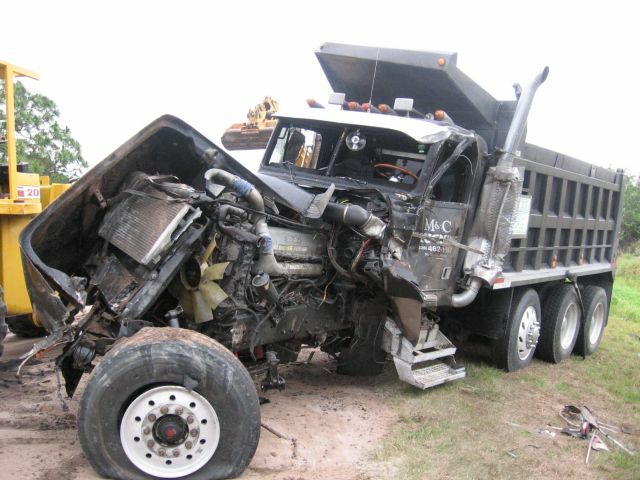 Two dump trucks were involved. Traffic was stopped for hours in both directions. It's unknown at this time whether there were injuries in either incident. We'll edit this entry as more info is available. Corkscrew resident Mark Hansen provided us with photos of the second wreck which can be viewed here. May 3, 2006 Cause of Six L's brush fire determined - Corkscrew neighbor Becky Reisen, whose husband is Lieutenant with the Estero Fire Department, reported that the source of yesterday's brush fire was a horse manure compost pile. Given the right conditions, compost can reach temperatures high enough to catch fire, especially in dry weather. No injuries or structural damage occurred. Many thanks to the Estero Fire Dept., State Dept of Forestry, and other local agencies for responding quickly to contain the blaze. May 2, 2006 Update: Fire under control - The News-Press reports that the fire is under control as of around 4:15 PM. The fire consumed about 5 acres and 5 homes were evacuated. Brush fire west of Six-L's Farm Road threatens homes - A brush fire, reported at around 1:30PM today is threatening several homes on the west side Six L's Farm Road. Residents of four homes have been told to evacuate, but the residents have refused to leave. April 27, 2006 Map showing new Corkscrew Road mining applications - click image for larger view. April 25, 2006 Third Corkscrew Road mining application confirmed - On 12/29/2005, Lee County DCD received an application from Golf Rock LLC to rezone 255.2 acres from Agricultural to Rural Planned Development for excavation on 144.8 acres to a depth of 150 feet with an expected duration of 10 years. After mining, the property will be developed with 24 single-family residences. Blasting is proposed. This application, along with Estero Group IPD and Corkscrew Excavation, has not been found sufficient by county staff for public hearings at this time. April 24, 2006 Corkscrew Neighbors establish community information line - Bill and Jim Lytell have set up a dedicated phone line for information about the proposed mining operations. They will keep the information up to date and will respond to those who call. The number is 948-3002. Please share this with neighbors and friends who don't have access to Internet & email. April 16, 2006 The Lee County Department of Community Development (DCD) maintains an online database of zoning applications. The application for the project owned by Resource Conservation Holdings, LLC is named "Corkscrew Excavation". You can view the permit status here. The application by Estero Group Limited - named "Estero Group IPD" - was determined to be "insufficient" by DCD staff. The applicant has 60 days from the date of determination to correct and resubmit the application. The status of that application can be found here. A draft report of the "Groundwater Resource & Mining Study" is available via the Lee County DCD website. The final report was due to be released in March 2006. In June, 2003, Lee Commissioners directed staff to commission a study of the water and mineral resources in lands designated as DRGR (Density Reduction Groundwater Recharge). Interest in the study rose at that time as Lee County sought to amend the Land Development Code as it applied to mining. As mining regulations were tightened, a staff-produced map showing where mining should be allowed was dropped for lack of documentation and concern by residents that their voices would be silenced if the map was accepted. Residents opposed to mining operations near their homes and mining interests called for fresh information. The study was awarded to consultant Greg Rawl, Professional Geologist. Assessments made by the study will be used by the County in future planning decisions. Dust off your boxing gloves friends and neighbors - the latest "Gold Rush" to industrialize Corkscrew Road has begun. Resource Conservation Holdings, LLC proposes to mine a 1,365 acre site to a depth of 20 feet. Estero Group Limited proposes to mine a 318 acre site to a depth of 95 feet. Both operations will utilize Corkscrew Road for transport of their excavated material. Many residents of the East Corkscrew Road Rural Community are concerned about the effects of increased mining activity on their health and safety, quality of life, the aesthetics of their land and surrounding land, property values, truck traffic, noise, lights, dust, potential pollution and other nuisances, as well as damage to the fragile ecosystem that many of us prize in southeast Lee County. Countering a threat to our community's safety and quality of life requires commitment. Of course, the most important commitment needed is your time and energy; for meetings, letter writing, information gathering, communicating, and for participating in the decision-making process. Time off from work to participate in these activities will be costly for many of us, and that is appreciated by all. No hearing dates have been set at this time. In the near future, we will schedule a neighborhood meeting to discuss our options and strategies to oppose the increase in mining activity on Corkscrew Road. Stay tuned to this website for news and updates. Sign up for the “neighbors” mailing list if you support our efforts and are a residential land owner east of the Alico-Corkscrew intersection in the East Corkscrew Road Rural Community / Corkscrew Settlement. Sign up for the “friends” mailing list if you live in other areas and support our efforts to stop expanded mining on East Corkscrew Road. If you are already subscribed to the neighbors or friends mailing lists, but your e-mail address has changed since November 2003, please send your new address to me at webmaster@corkscrewroad.com so that I can update the list. Communicate with your neighbors about the proposed mines, about this website, and about ways we can work together to preserve the community that we value. Share your ideas via the mailing lists above. It's not clear at this time what the financial costs will be, however it's likely they will be significant. Winning these battles will require legal representation, and testimony from expert witnesses. We've got good people "in the trenches" that will work out the details, but they can't foot the entire bill. We'll discuss ways to coordinate contributions and provide accounting for those that can contribute when we meet in the near future. I'll be busy over the next few days updating and reorganizing this website. If you come across news or other info you'd like to share, or notice errors on the site, please let me know by emailing me at webmaster@corkscrewroad.com. A letter in opposition to the latest mining application was recently mailed and hand-delivered to Corkscrew Road residents by Jim Lytell. In case you didn't receive a copy, you can read it here.